Common magnesium chloride deicers used on roadways and bridges around the U.S. may be doing more damage than previously thought, researchers have found. Additionally, that damage is unlikely to be detected using standard visual inspections, the typical method of assessing bridge health. Researchers from Washington State University and Montana State University found that samples of concrete exposed to magnesium chloride in the laboratory with repeated freeze-and-thaw cycles lost more strength than samples exposed to rock salt—even though they showed no visual signs of damage. The researchers report on their work in the journal, Cement and Concrete Research. The work was funded by the US and Oregon Departments of Transportation as well as by the National Natural Science Foundation of China. Transportation officials in the U.S. began using magnesium chloride about 20 years ago. Like rock salt, magnesium chloride prevents ice formation on roadways. It works well, particularly, in extremely cold temperatures when rock salt stops working. Magnesium chloride also is thought to be a more environmentally friendly alternative to rock salt. In the U.S., about 20 states affected by cold weather use magnesium chloride for snow and ice control, sometimes in combination with other treatments or, in a few cases, as the only treatment. In recent decades, the new treatments, including the use of magnesium chloride, have led to improved driving conditions on winter roads. At the same time, researchers have known that many types of road salts, including magnesium chloride, degrade concrete, causing both physical and chemical deterioration. But, they lacked a clear understanding of the tiny microscopic changes in concrete that induce considerable impacts at larger scales. 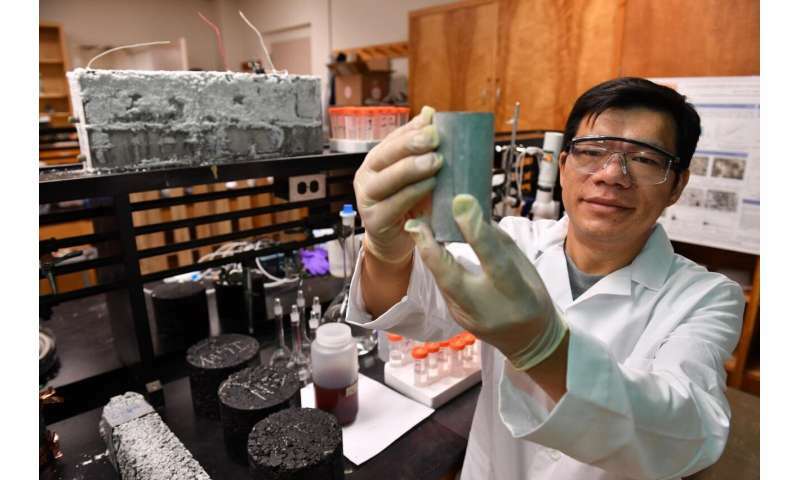 In the study, led by Xianming Shi, associate professor in WSU's Department of Civil and Environmental Engineering, the researchers were able to unravel how nano-sized crystals form within concrete samples. The formation of these crystals resulted in stress buildup and calcium leaching in the concrete, both of which significantly reduced its strength. They also found that none of the magnesium chloride samples showed any typical visible distress even after 10 accelerated cycles of freezing and thawing. In addition to the laboratory observations, the researchers tested sample cores from about 10 Oregon bridge decks that had been treated annually with magnesium chloride. They discovered a significant compromise in splitting tensile strength, which is a property that affects cracking resistance and load-bearing capacity, by as much as 50 percent. They also saw an up to 60 percent reduction in the concrete's micro-hardness. The worst effects often occurred half an inch to one inch inside the sample, instead of on the concrete surface. Some of the samples that had the significant degradation within the concrete had been rated as good or satisfactory in bridge inspections. Shi compared the chemical's invisible degradation and concrete softening to what happens with aging osteoporotic bones. "With rock salt, you can see there's a problem, due to visible symptoms such as scaling and spalling;" he said. "In the case of the magnesium chloride, however, when you can see something, it might be too late to fix." A webinar series for transportation officials on holistic and sustainable winter road treatments is being organized by Shi.